Looking for inventive ways to engage your audience without having to take time to write posts? Both Facebook and Instagram feature a “Live” video option where you can instantly relay to your followers the latest office happenings. First things first, how do you go live? Before you decide to go live do a tiny bit of pre-planning by announcing to your followers that you will be going live at a certain date and time so they can make sure to tune in. From there going live is easy! When you are on Instagram open up your “Stories” and switch over to “Live”. If you are going live on Facebook, choose the “Live Video” option in “What’s on your mind” at the top of your Facebook feed. Office parties! Celebrating a birthday or anniversary at your office? Share the moment of gift giving, birthday singing, and merry-making shenanigans with your followers by doing a live stream during the height of the celebration! Day in the life of your office. Pick a day every week where you have a live morning segment at your office showcasing either willing patients, staff, or providing weekly office updates to your viewers. Q & A your staff! Hold a live question and answers so your followers can become better acquainted with your office. Pre-plan a few questions but then ask questions to the audience for active participation. Promoting event, contest, or promotion. Live streams are great ways to announce the beginning of a promotion or contest your office is holding. Remember, at the end of a contest make sure to reveal the winner on a live stream as well. Choose a good location for the live stream and make sure you have a strong WiFi connection so the live stream doesn’t cut out. Make sure to pay attention to the comments left by viewers during your live stream and respond accordingly. 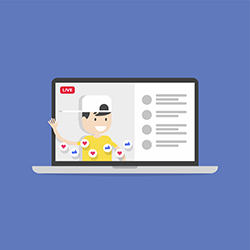 Also don’t be shy about asking your audience questions—this will get them more engaged with you during the live stream. At the end of your live stream ask viewers to follow if they aren’t already. While your Sesame Social Team can’t do the Live stream for you (after all, it is all about you! ), we are more than happy to discuss strategies and how-tos with you. If you have hit a roadblock, give us a call or send us an email and we are happy to help you take your practice Live! Happy streaming!